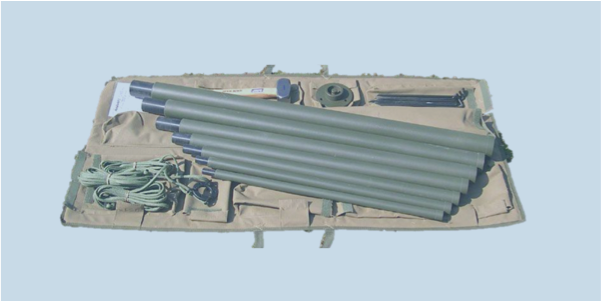 RSM-4 is a man-portable mast for elevating lightweight wire antennas on temporary base stations or forward command communications outposts. RSM-4 is used with any lightweight, small wind-area antenna. It is packed complete with all accessories: baseplate, guy ropes, mallet, anchor pegs, and carry bag. Easily deployed by one person in less than 5 minutes. The lightweight fiberglass sections fit inside one another for compact storage and easy transport.